Scary movies or horror movies have been part of producers’ repertoires since motion pictures were first introduced in the late 19th Century. The classification of “horror” is relatively new. Horror is difficult to define, but there is one facet of horror movies that makes them unique. That is, the ability of the movie to remove the viewer from a place of security–be it a physical location, or a deep-seated psychological thread. This quality can be demonstrated through more techniques and themes than could be counted and described. Romero’s experiment into the supernatural was more than frightening for audiences in the 60’s. Not only did this cult classic break all the rules for lead characters and what is acceptable to general audiences, but it influenced every horror film maker that came after it in some way. Dawn of the Dead which is also popularly known as the zombie is written and directed by George A. Romero and released in 1978, the movie was actually shot over approximately four months, from late 1977 to early 1978, the second in the living dead series. In the film, an ever-increasing epidemic of unknown origin has caused the dead to rise up and prey on human flesh, this resulted to mass hysteria. Two Philadelphia SWAT team members, a traffic reporter, and his television-executive girlfriend seek refuge in a secluded shopping mall. Dawn of the Dead was chosen by Empire magazine as one of The 500 Greatest Movies of All Time in 2008, the movie was remade in 2004. The cast features the likes of David Emge, Ken Foree, Scott Reiniger and Gaylen Ross as survivors of the outbreak. This early Wes Craven film not only deserves a spot in the top 10, but it is a prime example of how true horror can sometimes emerge from the mundane. This movie very well could be considered the Godfather of “shock horror”. This is an American film directed by Dennis Iliadis and written by Carl Ellsworth and Adam Alleca, It is about the parents (Goldwyn and Potter) of Mari Collingwood (Paxton), who attempt to get revenge on a gang, led by a prison escapee, a man named Krug (Dillahunt) who unknowingly finds refuge at a vacation home that belongs to the parents of one of the victims during a thunderstorm. The Collingwoods discover that Krug and his group have raped and shot their daughter and left her for dead. The parents of the deceased had to devise an increasingly gruesome revenge tactics. The bar for gore on film was skyrocketed into the upper atmosphere with this 70’s bloodbath. Murder, mayhem, man’s inhumanity toward men and outright, pukey and putrid themes like…gulp…cannibalism hit the big screen in a big way. After this look into the dirty, filthy, grimy American South, horror was never the same. Any horror film top ten list would be incomplete without mentioning of the movie that convinced modern audiences that the possibility of terror being unleashed by higher powers into any household was real. The makers of this monumental film combined history, media, suburban culture and innocence with the ravages of demonic possession. The incredible mind of Stephen King brought us this made for TV horror film. Top ten horror means vulnerability. The unforgivable terror of children was thrust upon us by the demon Pennywise, everyone’s most feared clown. They all do “float down here”. This movie is about seven outcast kids known as “The Loser Club” who fought an evil demon who poses as a child-killing clown. 30 years later, they are called back to fight the same clown again. This Best Picture Oscar winner was chosen as the best suspense/thriller for Best in Film: The Greatest Movies of Our Time, the movie is based on Thomas Harris’ 1988 novel of the same name, his second novel to feature Hannibal Lecter who is a brilliant psychiatrist and cannibalistic serial killer, a young FBI cadet must confide in an incarcerated and manipulative killer in order to get help on catching another serial killer. The Silence of the Lambs won the 1991’s best film, according to the Academy. Hitchcock implanted some of modern film’s most iconic imagery and human weakness in this obvious top ten movie. Every horror film that came after preserved a Hitchcockian ideal. There’s nothing safer than family–until Michael Myers proved everybody wrong. Top ten horror flicks should convey one thing–you can’t trust any living soul. This schism in top 10 horror history removed the final barrier between good triumphing over evil. Audiences didn’t sleep for weeks after watching Freddy Kruger rip apart their sense of security even their in dreams. Pinhead and his legion of cenobytes were poured out of the twisted imagination of Clive Barker and from the pits of Hades itself. No other horror movie has bundled all the themes of horror in the past into one neatly contained, uniquely paced Dada-istic fantasy like the Hellraiser series. 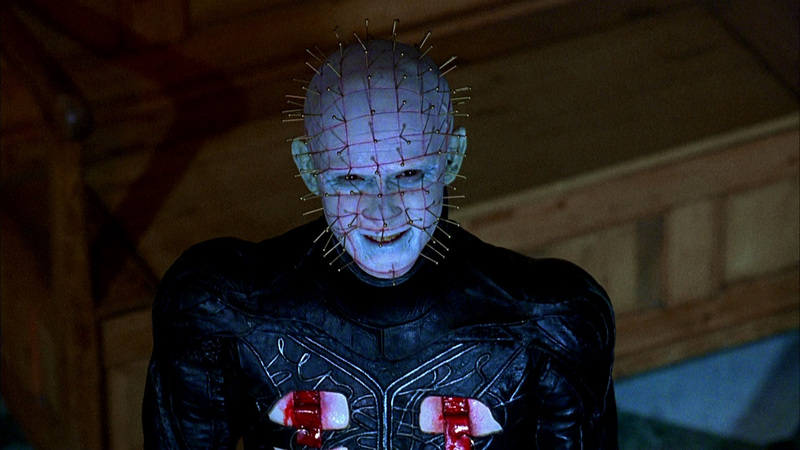 Hellraiser has hooks, chains, demons, lore, modern special effects, tearing, slashing, timeless icons, PAIN and Shakespearian linguistic devices that boggle the mind, trouble the soul and make us wish we would have never had that one “dirty little secret”. It has a world class soundtrack as well. It is the complete Top 10 horror film package and it’s ranking number one our list.